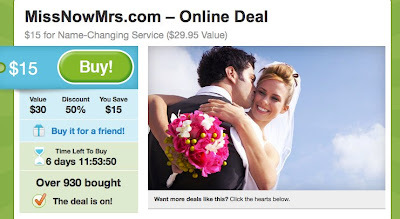 A Bedazzled [kind of] Life: Groupon Deal Alert! Planning a marriage brings about many challenges, such as choosing whose name to list first on the balloons and identifying which bridesmaid has been licking the wedding cake. 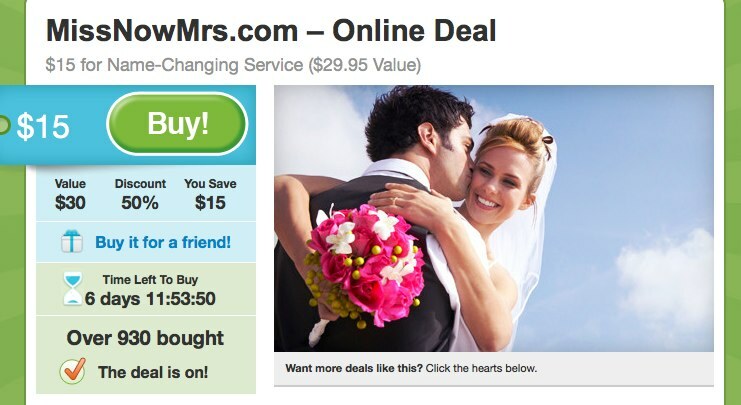 Overcome one of many nuptial anxieties with this Groupon. After brides-to-be answer a few questions, MissNowMrs.com fills out all the forms needed to change names in a process lauded for its simplicity in myriad publications. Gift givers can exchange this Groupon for a gift card. MissNowMrs.com has expedited the lengthy process of legally metamorphosing monikers for more than 90,000 newlyweds across all 50 states, winning the admiration of Reuters and the Baltimore Sun. Frustrated by the complex and confusing name-changing process, MissNowMrs.com owner Danielle Tate spearheaded the simplifying service. 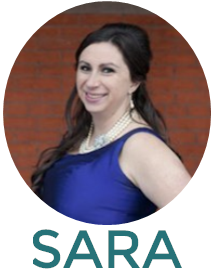 The straightforward process steers clients through the completion and filing of necessary government, bank, insurance, and personal forms, and customer-service experts man the phones and online chat rooms to answer questions. Condensing the approximately 13-hour processes into as little as 30 minutes, the resource gives fledgling couples more time for honeymooning and knitting sweater vests for their future pet iguanas.